1. Get the steak cooked properly – Whether there is one large steak or multiple steaks, it is very important that you get the meat cooked so that it is juicy and flavorful. It is recommended that you get it cooked rare to medium rare, rather than well done. You want the steak juicy and moist so that you can cut, chew, and swallow the steak a lot easier. If your steak is overcooked and dry, it will be very chewy, and it will take significantly longer to eat the entire steak. Almost all steak challenges have a time limit less than 1 hour, so you cannot sit there all day trying to chew the meat. I have finished a perfectly cooked 87 oz steak in less than 15 minutes, and I have done a few dry and overcooked steaks in around 42 minutes. Get the meat cooked properly, and your jaw and wallet will thank you. Failing a steak challenge usually costs over $50, so be sure that it’s cooked right. 2. Use a very sharp steak knife – The most time consuming activity during a steak challenge is definitely cutting up the meat with your knife and fork. For a large steak, you will need to cut it up into many tiny pieces so that you can consume it, so therefore you need the sharpest knife possible to cut it up with. Do not settle for the dull knife that the restaurant will probably bring you, because a dull knife will cause you to waste a lot of precious time and energy trying to get the entire steak sliced up. Most restaurants and steakhouses are accommodating for this type of request, so be sure to ask your server, or the chef if necessary, for the sharpest knife possible. 3. Cut the meat into very small pieces – As mentioned in #2 above, you need to slice the steak into tiny pieces so that you can consume the steak a lot faster and prevent your jaw from getting really tired halfway through the challenge. When speed eating, you need to focus on swallowing rather than chewing. Chewing is just a waste of precious time in most cases. If you try to eat large chunks, you will find that you have to chew each piece multiple times before actually being able to swallow it. You will have to chew each chunk down into smaller, more manageable pieces, which you could have done with a knife a lot faster. To be successful at steak challenges, you need to master eating and cutting at the same time (multi-tasking). You will find that it is a lot more efficient and productive to slice the steak into multiple tiny pieces before putting them in your mouth. 4. Eat the steak first – This is listed as a basic strategy, but I am including it again here to stress that you need to focus on eating the steak (meat) first. The only exception to this rule is if there is a required side item that you don’t like the taste of. In that case, you should eat that in the beginning while you are fresh and feeling good. You won’t want to eat it later. For all other situations though, you want to eat the steak while it is warm, juicy, and delicious. If you eat everything else first and let the meat get cooled down and dry, it will be tough to chew and not taste as good. You will then have to use sauces and a lot more liquid while you are eating the beef, which takes up room in your stomach. 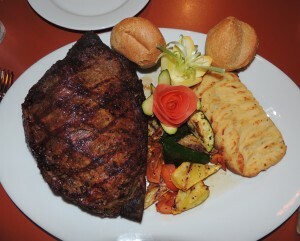 In most challenges that involve meat such as a steak challenge, the meat makes up over 2/3 the weight of the challenge. Since you want to eat the toughest parts first and then coast to the finish line, eat the steak first!! Your chances for success are significantly higher when using this strategy. 5. Don’t cut it all up at once – If your food is really hot and you want to cool it down, what is one of the first things you do? You cut it in half and increase the surface area so that it can cool down. You want to do the exact opposite during a steak challenge. If it is just one massive steak that is the size of a roast, pick one corner to start from and then just keep cutting off pieces from the same spot. If there are multiple steaks, eat one steak at a time. You can only eat a steak so fast, and it’s going to be cooled down by the time you finish it, but there are ways to keep the steak warm and juicy for as long as possible. The main thing you can do is to not slice everything up at once. Keep the surface area of the meat to a minimum, and you do this by only cutting off small pieces at a time. Your steak will taste better for a longer period of time if you use this simple method too. 6. Be careful not to choke – There is a higher chance of choking during a steak challenge than there is during most other food challenges. This is because you are consuming chunks of dense meat and nothing else along with it to make it slide down your throat easier. Make sure to follow all of the rules above and take small bites, and you will be safe. The main precaution that you need to take is to make sure that you cut the pieces entirely with your knife, and don’t try to swallow two chunks still attached by a tendon or portion of fat. If you do that, there is a chance that you could be swallowing one portion while the other attached portion is still in your mouth waiting to be swallowed. If this happens, choking can occur. You also need to be careful once the meat cools down and becomes dry. Please be careful, take small bites, and have liquids handy in case a situation occurs. 7. Change up the flavor if needed – Using beverages to mix up the flavor is mentioned as a basic tip, but know that you can also use sauces to help your taste buds too. If the restaurant serves you a quality piece of meat that is tender and juicy, you should not need much steak sauce. Of course, that is not always the case though. If you begin to get tired of the taste and suffer from flavor fatigue, grab your favorite available sauce and mix things up. You can also use different liquids to change up the flavor too of course. Towards the end, once you have finished most of the meat, this is a point where you can start eating some of the side items too. If you have mashed potatoes, eat them with your steak. Eat the side salad or have some of the baked potato before finishing the last few bites of meat. Keep your taste buds guessing and intrigued, and you will be able to eat a lot more. 8. Ask the restaurant staff questions – For most steak challenges with side items included, you don’t get any choices, and you just have to eat what is placed in front of you. Some restaurants actually do give you options though. Like in the video, you may be able to chose your side item, and have a list to pick from. If you can’t decide which option you want, ask your server(s) which option you should pick. They work there and serve each of the options every time they work. They know exactly how big each item is, and they will be able to give you helpful insight that you can use when making your choice. More than 95% of restaurant staff wants you to win so they can tell other customers about you winning, so take advantage of their willingness to help you out. 9. Please use proper dining etiquette – The purpose of this tip is to briefly cover the use of your hands during a steak challenge. You may have watched a video of professional eater Molly Schuyler eating a 72 ounce steak in less than 3 minutes by picking it up with her hands and not using any utensils. If you have not seen it, click here. Another good video is watching Australian professional eater Colin MacLaurin win a steak eating contest using his hands. For that video, click here. If you are trying to eat a steak as fast as possible during a contest, or in front of a group of people that know you are trying to eat it as fast as possible (like Molly), you may choose to eat the steak with your hands. You will be able to eat it faster than with utensils as long as you still take small bites and order it correctly. If you are just simply attempting a steak challenge at your local restaurant and not trying to break records, please practice proper dining etiquette and use a knife and fork. Unless you are a really efficient speed eater, using your hands will not have a significant benefit over using utensils like every other person around you is. You will just look like a caveman (or cavewoman), and the restaurant manager most likely will confront you about your poor manners. Regular customers will not want to watch you eat like a pig, so practice proper dining etiquette and cut your steak into small pieces, unless you are trying to break a record. If you combine the above advanced tips with the Basic Strategy Tips For Winning A Food Challenge, you have all the major tips that you need to plan the strategy you will use to DOMINATE your next steak eating challenge.